The inventory scanner always scans the registry for the Custom Fields key and picks up any information it finds under that key. It then enters the custom information into Custom fields in the core database. The information in the Custom Fields keys can be whatever you need it to be. When you view this data in the console, it displays under Custom fields. The inventory scanner doesn't scan for any subkeys below Custom fields. ASCII character strings must be no longer than 255 characters. Multi-byte character set (MBCS) strings must be between 127 and 255 characters. You can specify when to scan a device's software and how long to save the inventory changes history log on the core server. These intervals apply to every device. NOTE: A device's hardware is scanned every time it boots and is connected to the network. In the console's network view, click Configure > Services > Inventory > Software. Specify the frequency of software scanning. Specify the number of days to save the history. This feature affects only devices. It doesn't affect the core server, which is always scanned daily. 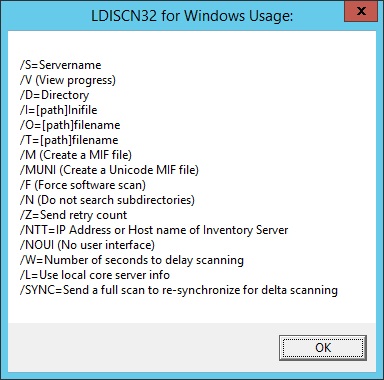 You can add command-line parameters to the inventory scanner's (ldiscn32.exe) shortcut properties to control how it functions.